Angus-Campbell, Inc. is a manufacturing and distributing business specializing in short run supply and fabrication of industrial plastics. We have been serving the food processing, lighting, electronics, aluminum, steel, custom knife, film, gear house and other industries for both mechanical and electrical plastic needs for over 75 years. Finding the right materials for your application or having a special part can easily bust your budget, especially if your supplier forces you to buy more than required by your application. Angus-Campbell, Inc. can quickly supply your project with special sizes and quantities of your required materials and machine the material into a part based on your specifications. With a complete machine shop, special fittings and parts can be quickly and expertly manufactured. Angus-Campbell, Inc. is an international supplier for Micarta, including canvas (C), canvas electrical (CE), linen (L), linen electrical (LE), epoxy glass FR-4 and G-10, glastic, glass polyester and most other laminates in sheets, rods, and tubes up to 7" thick. Angus-Campbell, Inc. can supply in small or large quantities as required. 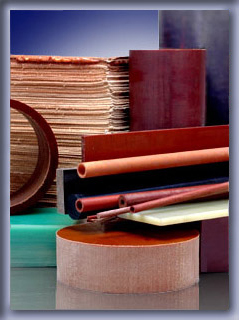 We are a stocking distributor for these high-pressure laminates and other materials. Please see our "Materials and Supplies" page for a partial listing. We can cut these materials to any size and quantity your project requires. Because we are a custom order house, no order is too small or too large. 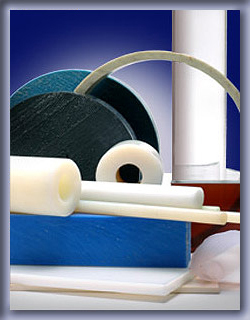 Among other plastics, Angus-Campbell, Inc. stocks acrylics, Plexiglas, cast acrylic, polycarbonate, Lexan, Tufak, Hyzod, nylon, acetal, Delrin, polyethelene, UHMWPE, HDPE. We stock a variety of these and other materials for quick delivery as required. will be happy to work with you to provide the best material to your project specifications. Angus-Campbell, Inc. maintains this inventory so you will not need to purchase minimum quantities to acquire the material you need for a one time usage, thus saving you money.